According to the Joint Committee on Cancer, the 10-year survival rates for stages I, II, III, and IV medullary thyroid cancer (MTC) are 100%, 93%, 71%, and 21%, respectively. Guidelines from the American Thyroid Association (ATA) and the North American Neuroendocrine Tumor Society recommend that standard treatment for clinical MTC consist of total thyroidectomy with prophylactic central lymph node dissection. To understand if this “one-size-fits-all” surgical approach to MTC is effective, Nazanene H. Esfandiari, MD, and colleagues conducted a study of nearly 3,000 patients with MTC. “We wanted to understand the factors that were associated with worse survival, including the role of more versus less extensive surgery,” she says. Dr. Esfandiari and colleagues gathered data from the National Cancer Database on patients who were diagnosed with MTC between 1998 and 2005. “Disease severity was characterized by the size of the tumor, the number of cervical lymph node metastases, and the presence or absence of distant metastases,” says Dr. Esfandiari. “We looked at the relationship between tumor characteristics, patient characteristics, and the extent of surgery with regard to overall survival.” Tumors were categorized into those that were 1.0 cm or smaller, 1.1 cm to 2.0 cm, 2.1 cm to 4.0 cm, more than 4 cm, or unknown. Interventions compared in the study included total thyroidectomy, lobectomy, and no surgery. Cervical lymph nodes were grouped as follows: one to five, six to 10, 11 to 15, and 16 or more positive nodes. 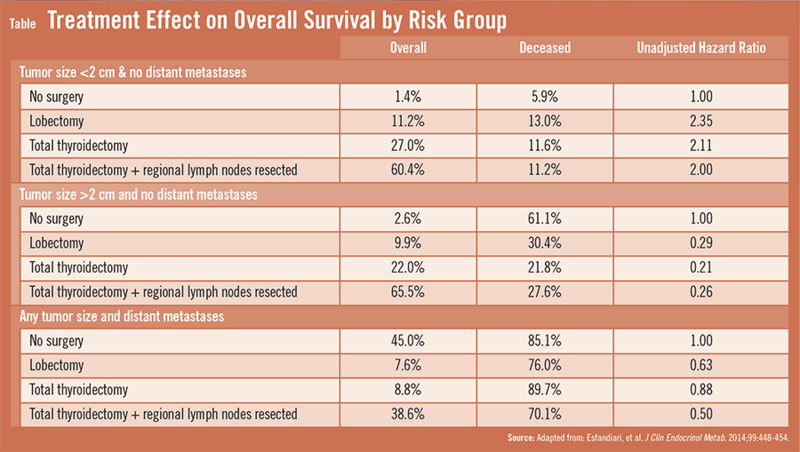 “We found that the overall survival rate was about 89% for patients with tumors sized 2 cm or smaller and no distant metastases,” Dr. Esfandiari explains (Table). “The extent of surgical intervention did not appear to affect survival in these patients because almost everyone in this group did well.” The overall survival rate decreased to about 72% in patients with tumors larger than 2 cm and no distant metastases. 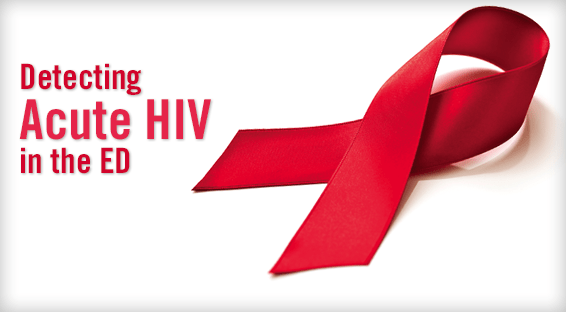 However, all surgical treatments were associated with increased survival in these patients. The presence of distant metastases had a significant impact on overall survival, regardless of tumor size. “Only total thyroidectomy with regional lymph node resection in patients with distant metastases significantly improved survival when compared with no surgery,” adds Dr. Esfandiari. After taking a slightly different look at the numbers, the research team found that 84% and 71% of patients with no cervical lymph nodes resected and no distant metastases were alive at 5 and 10 years, respectively. For those with five metastatic cervical lymph nodes but no distant metastases, the 10-year survival rate decreased to 70%. 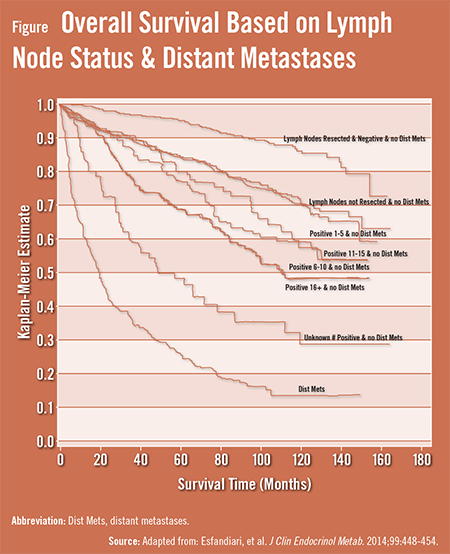 Among patients with 6 to 10 lymph node metastases, the 5-year survival rate was 77%, and the 10-year survival rate was 59%. The 5-year survival rate jumped back up to 80% for those with 11 to 15 lymph node metastases, whereas the 10-year survival rate continued to decrease, dropping to 57%. The 5-year and 10-year survival rates were 68% and 48%, respectively, for patients with 16 or more lymph node metastases. Only 26% of patients with distant metastases were alive at 5 years, and only 14% were alive at 10-years follow-up. Esfandiari N, Hughes D, Yin H, et al. The effect of extent of surgery and number of lymph node metastases on overall survival in patients with medullary thyroid cancer. J Clin Endocrinol Metab. 2014;99:448-454. Available at http://press.endocrine.org/doi/abs/10.1210/jc.2013-2942. Kloos R, Eng C, Evans D, et al. 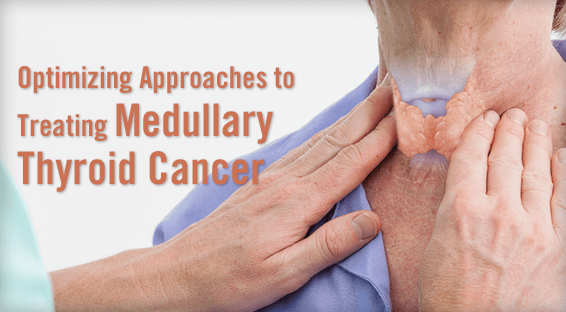 Medullary thyroid cancer: management guidelines of the American Thyroid Association. Thyroid. 2009;19:565-612. Chen H, Sippel R, O’Dorisio M, et al. The North American Neuroendocrine Tumor Society consensus guideline for the diagnosis and management of neuroendocrine tumors: pheochromocytoma, paraganglioma, and medullary thyroid cancer. Pancreas. 2010;39:775-783. Machens A, Dralle H. Prognostic impact of N staging in 715 medullary thyroid cancer patients: proposal for a revised staging system. Ann Surg. 2013;257:323-329. Nazanene Esfandiari, MD, has indicated to Physician’s Weekly that she has no financial disclosures.